During a military career spanning 38 years, Lt. Gen. Tariq Waseem Ghazi (Retd.) was appointed to key operational, command, policy formulation, crisis management and leadership training positions. He trained with the Australian and Canadian militaries, led a multinational United Nations Peacekeeping Mission, and was commandant of the two top training institutions for Pakistani military officers: the Staff College, Quetta, and the National Defence College, Islamabad. Lt. Gen. Ghazi (Retd.) was appointed Secretary of Defence in May 2005. He oversaw the working of the defense establishment in Pakistan and represented the country’s interests nationally and internationally as co-chair of several security dialogues. 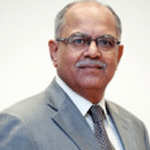 He has served as chairman of the Civil Aviation Authority, the Fauji Foundation, the Defence Housing Authorities, PIA Investments, and as chancellor of Foundation University, Islamabad. Presently, he serves on the boards of Sadiq Public School and The Kidney Centre. A recipient of the Sword of Honour, two international, and fifteen service awards, Lt. Gen. Ghazi has also been decorated with the Hilal-i-Imtiaz (Military) for his services to the country.